SNAFU! : Hurricane Irma is promising regional destruction. Hurricane Irma is promising regional destruction. Wow. Don't know if this is just fear mongering from meteorologists but this hurricane is looking like a real life Godzilla on some super strong Tren. Even worse? The European and US tracks are meeting and its gonna be bad (if they're right). This thing is suppose to go straight up the center of Florida from South heading North, crash into Georgia and then give S. Carolina, N. Carolina, Tennessee, West Virginia, Virginia and the rest of the Northeast a undesired kiss. 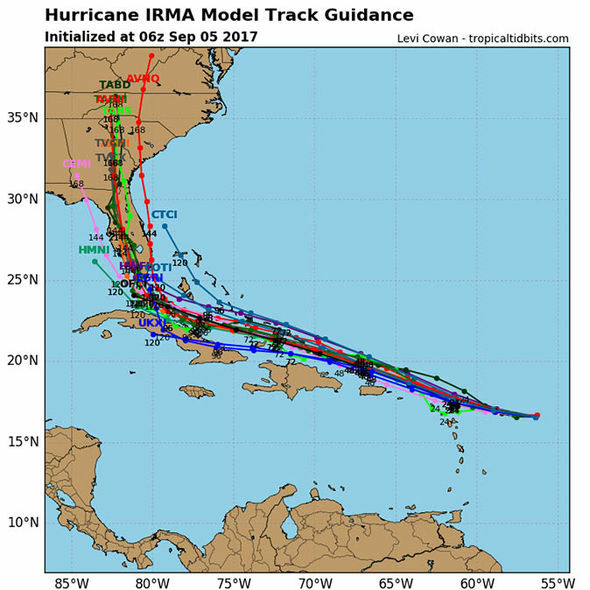 My worry is Florida and Georgia. Consider this. Think about modern houses. Unless you're a millionaire you aren't buying a house that can withstand 175 mph winds. The punch in the face those people are about to receive is gonna make the drama from Harvey look like good times (oh and once again the Marine Corps fucked up...they sent the Kearsage to the Virgin Islands when they're gonna be needed big time in the continental US). Between wind damage, storm surge, flooding and the popup tornado it's gonna be a bad time. I will never believe that we are victims to fate. We will always have SOME control over outcomes...no matter how small that might be. This storm gives me pause though. If we're entering a phase where storms of this intensity are the norm then bugout plans need to be revised. Simply planning a trip that takes you 600 miles from the scene and a two or three day stay isn't gonna be enough in certain locations. Think about it like this. If you live in Miami and you're doing your best to safeguard yourself and your family then you need to actually plan to drive to say Gulfport Mississippi to stay out of the storm damage. I'm sure many thought that just driving to Georgia would be enough. Speaking of Georgia. This thing is gonna slam right thru the center of that state. Have you ever been to Georgia? I'm not talking about Atlanta, but to back woods Georgia. They're gonna be eradicated from the face of the earth if this thing maintains strength going thru there. Harvey was bad, Irma will be worse. Regional destruction is on the plate. The only real question is this. Are we entering a period where this is normal?